The Space Age Solar Cover includes a unique aluminum heat shield that traps otherwise lost heat back into the pool from the special aluminum underside. The Heavy-duty material works with the sun to catch and retain heat. Solar covers float "bubble side down" on the surface of your pool water when the pool is not in use, allowing solar energy to pass through and trapping it as retained heat in the pool. Helps raise the water temperature by absorbing sunlight during the day and retaining the heat at night, extending the pool season. Savings come from a reduction in water evaporation decreasing chemical consumption. 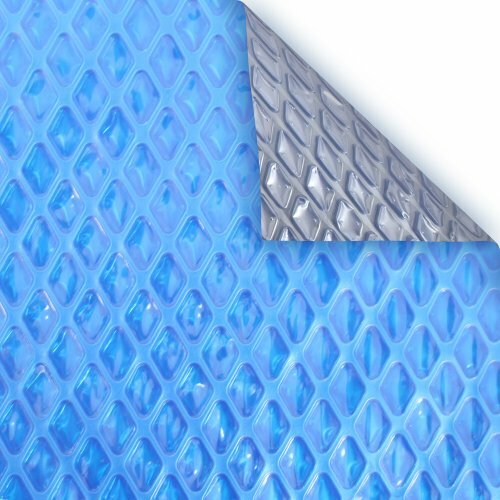 Material is highly resistant to ultraviolet rays which inhibits deterioration. 14.6% greater heat retention.